Since I bought my H&M faux fur collar, I’ve had tons of compliments on it and people asking everything from where it’s from to what to wear it with. Hence why I’ve decided to feature it in this week’s post. The one in the outfits is the same as mine, only a lighter colour fur. I know it’s available in a few shades online, but I’m not too sure about in stores. This was a fun one to do as being an accessory there is more room to experiment rather than if the item were a dress or coat ( speaking of which, I’m thinking of using a Barbour Jacket in this post next week – thoughts?). As usual, there are two looks, one casual, one formal, so here goes! 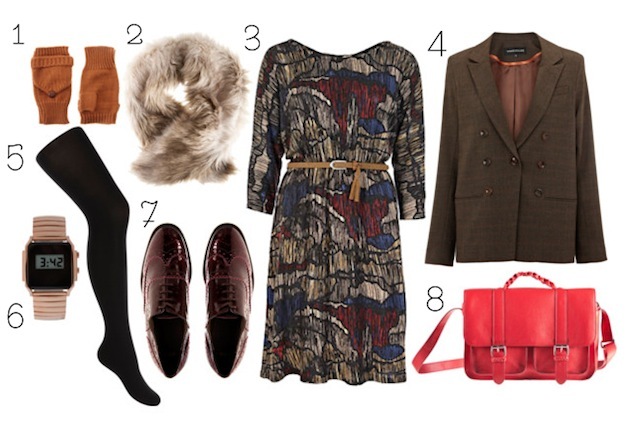 Teamed with a vintage inspired dress and tweed jacket, the fur stole would look gorgeous left open similar to a scarf. I’d wear opaque tights and flat brogues in a shade taken from the dress, and carry a bag in a contrasting colour for a fun twist. Finishing touches would include fingerless gloves and a retro gold watch. For evening, I’d wear a bold, eye-catching dress in one simple block colour, teamed with black for a classic sixties feel. A lightweight blazer jacket, opaque tights and chunky ankle boots bring this look up to date, whilst the fur and gold jewellery keep it sophisticated. I’d paint my nails in gold and black for a modern twist, and carry a mock crock doctors bag. Have any of you got hold of the H&M faux fur collar? I wouldn’t be surprised if it sells out everywhere and fast! Its such a great piece for winter. What do you think of the two looks? Which is your favourite? Love this! I have the same fur collar so might just take some inspiration from these. I love these type of post, although they make me build up a wishlist as long as my arms! Oops!